A savoury dish that features cardamom? Count me in. My first bites of this pilaf with beef were at a friend’s house. When she told me that there were no other spices used besides cardamom, I could hardly believe it. So I remembered her description of how to make it. This recipe would be a delicious new way to stretch the locally raised beef and lamb in our freezer. Soon I discovered for myself how just a few simple ingredients can blend together beautifully. When I made this in my kitchen, the more cardamom I added, the better I liked it. My friends from Jordan and Iraq have taught me not to be afraid to add more spices. They are the secret to taking a plain and simple dish into the realm of the extraordinary. If you are cooking for more than three people, I would suggest doubling the recipe, as I do in order to feed my family of six. Also, in the future I would like to taste how this works with vegetable broth and some vegetables in place of the meat. I suspect that the cardamom would make this pilaf work very well as a vegetarian dish too. Season the meat with cardamom. Heat olive oil in a large saucepan with the lid off. Saute meat over medium-high heat until evenly browned. Add 2 cups of water and continue to cook the meat with the lid on until meat is cooked through. Carefully remove hot meat from saucepan and set on a plate to cool. To the remaining warm broth, add 1 cup rice, 2 cups chickpeas and 1/2 teaspoon sea salt. Cover and simmer rice for 20 minutes. Turn off heat but keep lid on to retain warmth. When meat is cool enough to handle, shred into small pieces with forks or your fingers. Season meat with sea salt to taste. Add shredded meat to warm rice and stir to blend. Season with remaining cardamom and add sea salt to taste. Add more cardamom if desired. 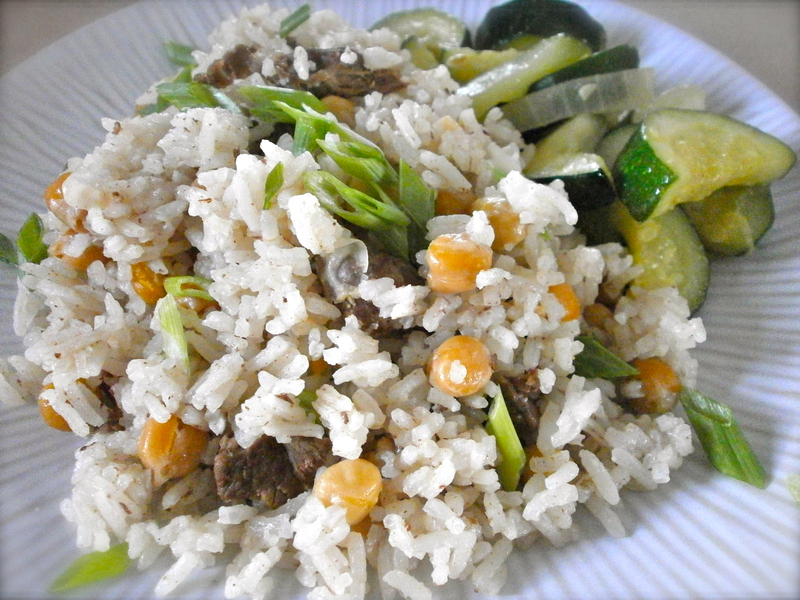 Serve pilaf warm, garnishing with fresh parsley or chopped green onions if desired. I’m sharing this recipe at Tuesday Talent Show, Pennywise Platter, and Gluten Free Fridays.